One of the things that haunts me about my Uncle Ernie Coffman's memories of growing up is the fact that he did not really have a father. Was that hard not really knowing your Dad very long? Did you have a surrogate Dad? = Hell's bells, Nick! I didn't know my dad at all. I was too young to know him. My mother re-married somewhere along the line and I had a step-dad, who tried to be a male influence on me, but he and I had our squabbles, etc. My own experience contrasts sharply with Ernie's. My father is still living and despite the fact that he is on the Left Coast and I am on the Third Coast, we are very close. I love him dearly and I know that he loves me too. To not have that in your life has to have been hard. I am really looking forward to my next visit with my father. Anyone who has any love for genealogy knows that life is unpredictable and missed opportunities to have learned from our elders abound. I wish that I could have known both of my grandfathers better. I never got to meet my paternal grandmother. Perhaps that is a bit of what inspires me to search their ancestry. It is also what motivates my wife and I to be as close as possible to our grandchildren. The Y chromosome is transmitted from father to son. Testing the Y chromosome provides information about the direct male line, meaning the father to his father and so on. The locations tested on the Y chromosome are called markers. Occasionally a mutation occurs at one of the markers in the Y chromosome. Mutations are simply small changes in the DNA sequence. They are natural occurrences and take place at random intervals. Overall, they are estimated to occur once every 500 generations per marker. Mutations can sometimes be valuable in identifying branches of a family tree. While we await the test results from Ernie's y-DNA test, we will step back one generation each week on the Coffman Family Tree. 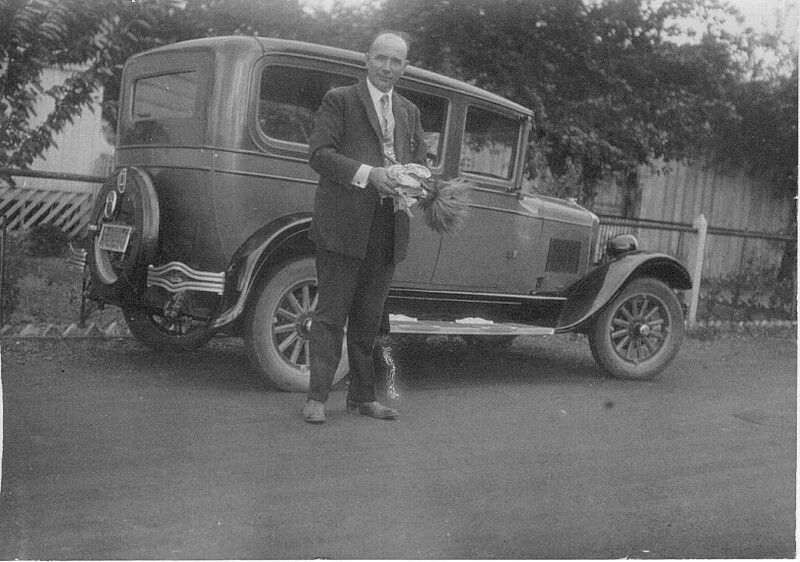 Today we feature Ernie's father and namesake, Ernest Ellsworth Coffman, Sr. 1879-1934. It is somewhat ironic that Ernie's father died in 1934 and my father was born that same year. 1. Ernest Ellsworth Coffman was born on 22 Jul 1879 in La Harpe, Hancock, Illinois. He died on 17 Sep 1934 in Oakland, Alameda, California. He was buried on 28 Sep 1934 in Mountain View Cem, Oakland, Alameda, California. Ernest married (1) Mae Blanche Moss daughter of John Moss and Anne B. Lanstein on 5 Feb 1907 in Oakland, Alameda, California. Mae was born on 19 Feb 1882 in Galveston, Galveston, Texas. She died on 9 Nov 1963 in Oakland, Alameda, California. She was buried on 11 Nov 1963 in Sunset View Cemetery, El Cerrito, Contra Costa, California. 2 F i. Elaine Blanche Coffman was born on 29 Aug 1910 in New York, New York. She died on 7 Jun 2010 in Concord, Contra Costa, California. She was buried on 25 Jun 2010 in Sunset View Cemetery, El Cerrito, California. Elaine married (1) Engel True Mayne son of Joseph Hanson Mayne Rev. and Anna Elizabeth Banford on 16 Jun 1928 in Oakland, Alameda, California, USA. Engel was born on 18 Mar 1899 in Verona, Preble, Ohio. He died on 11 Feb 1967 in Santa Rosa, Sonoma, California. He was buried on 17 Feb 1967 in Colma, San Mateo, California. Elaine married (2) George William Kelly son of John Caesar Kelly and Annie Marie White on 24 Oct 1937 in Reno, Washoe, Nevada. George was born on 21 Jul 1911 in Tacoma, Pierce, Washington. He died on 8 Oct 1991 in South Lake Tahoe, El Dorado, California. Elaine married (3) Warren Campbell De Guire son of Arthur Henry Deguire and Irene Anna Campbell on 4 Jun 1994 in South Lake Tahoe, El Dorado, California. Warren was born on 23 Jun 1911 in San Francisco, California. He died on 19 May 1997 in South Lake Tahoe, El Dorado, California. Elaine married (4) Richard Thomas Gross son of Paul Joseph Gross and Gladys Martha Cody Burcha on 9 Sep 1999 in Zephyr Cove, Douglas, Nevada. Richard was born on 22 Oct 1933 in Minneapolis, Minnesota. He died on 11 Sep 2003 in Arizona, USA. 3 M ii. Male Coffman was born in 1912/1914 in , , New York or New Jersey. 4 F iii. Vivian Lucile Coffman was born on 24 Jan 1916 in Edgewater, Bergen, New Jersey. She died on 12 Oct 2011 in El Cerrito, Contra Costa, California. She was buried in Sunset View Cemetery, El Cerrito, California. 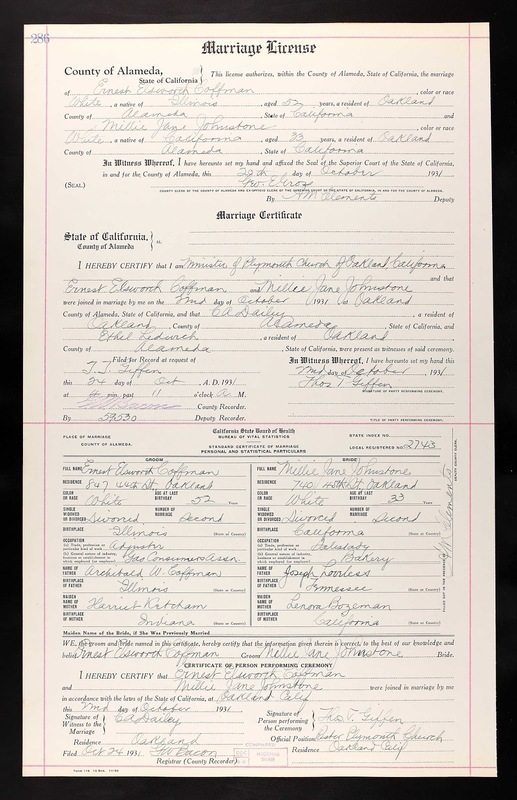 Ernest married (2) Mildred Jane Loveless daughter of Joseph De Fayette Lovelace and Lenora Bozeman on 22 Oct 1931 in Alameda, California, USA. Mildred was born on 11 Aug 1898 in Fresno, California, USA. She died on 16 Apr 1989 in Hollister, , California. 5 M iv. Ernest Ellsworth Coffman Jr. was born on 24 Dec 1932 in San Francisco, San Francisco, California. Ernest married Joanne Carol Larson daughter of George Gustave Larson and Alma Ethel Zwicker on 19 Dec 1958. Joanne was born in 1935 in California. !CENSUS:1880 San Joaquin Township, Sacramento Co., CA;Vol 8, E.D. 112,Sheet 14, Line 39 ! Fifth Ave. Hotel, his father is also listed at the same address and same employer. 24th p. 311 GAS COMPANIES, Oakland Gas Light and Heat Co., John A. Britton, President, A.T.
2d and Washington, 2d and Grove and 1st and Grove. !RESIDENCE: 1903-1907 Oakland City Dir. 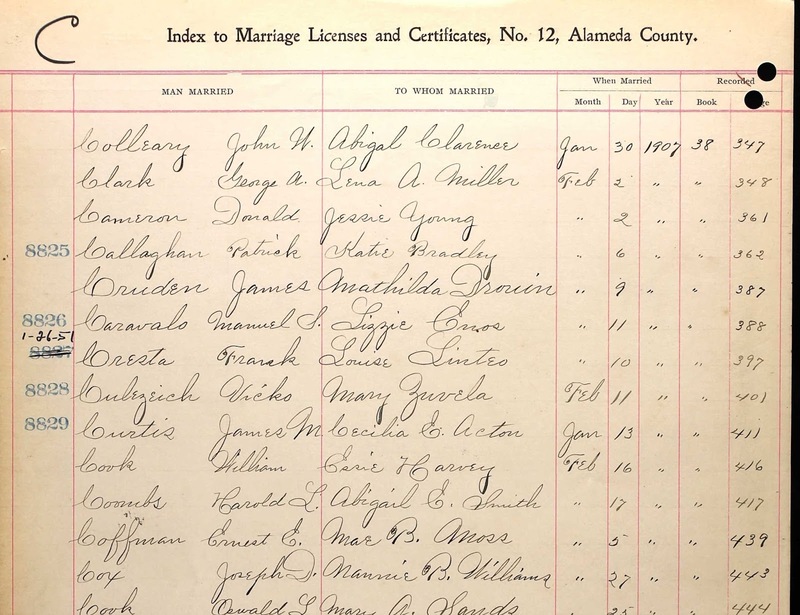 !MARRIAGE:1907 Alameda Recorder's Office, Book 38, Pg. 439. Alameda City. Service performed by Henry H. Wintler, Clergyman. 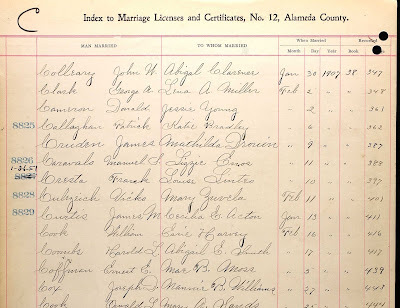 !CENSUS:1910;110 W. 138th Street;Manhattan Borough, NY, NY;16 April 1910;E.D. 528, p.
7A; Enumeration District: 528; Image: 1046. !RESIDENCE: 1913 NY City Dir. Ernest E manager 17 E 125th home Edgewater NJ. ! !RESIDENCE: 1918 NY City Dir. no listing for Ernest E. 1916 and 1917 not on the shelf at Sutro. 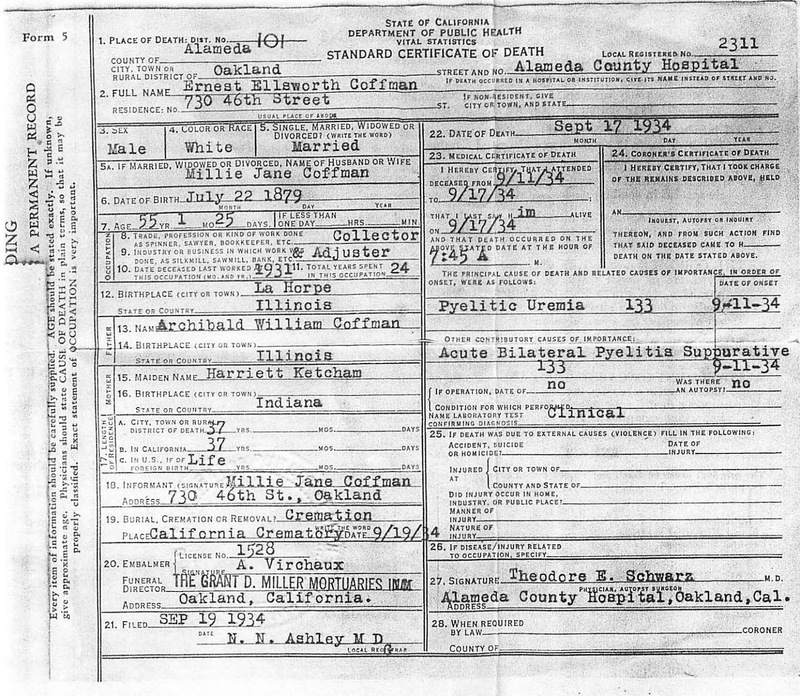 Database: World War I Draft Registration Cards, 1917-1918 December 25, 2005 5:36 PM Name: Ernest Elsworth Coffman Residence: 742 46th Street City: Oakland County: Alameda State: California Birth Date: 22 Jul 1879 Race: White Roll: 1531208 DraftBoard: 2 Registration Date: Sept. 12,1918 Age: 39 Occupation: Salesman Nearest Relative: Wife, Mae Coffman Registration Place: Oakland Height: Medium Build: Medium Color of Eyes: Brown Color of Hair: Brown Source Information: Ancestry. Oakland; OCCUPATION: Salesman Automotive Tires. !RESIDENCE: Before Ernest and Mae purchased the Aileen Street house they rented a little duplex on 46th Street three doors from West. !LAND: Date Filed: Dec 28 1922; Series Number: 247640; Grantees: Coffman, Ernest E.; Grantors: Elias Berger; Title: Deed; Vol 313; Book: Official Records; Page 365; For Sum of Ten dollars, Being all of lot # 3 in Block E Map of Kenwood Park Oakland, California. This property is 885 Aileen Street. !OCCUPATION-RESIDENCE: 1923 Oakland City Directory; Coffman Bros. (E E and O L) auto tires 285 12th; Coffman Ernest E (Coffman Bros) h 716 Castro; he is no longer residing with Mae. !RESIDENCE: 1924 Ernest & May(sic) 885 Aileen; Oakland City Directory; the Great Register of Voters for the same year lists Ernest as a salesman and a Republican. Mae is not listed. !OCCUPATION-RESIDENCE: 1925 Oakland City Directory; Coffman, EE imp (did not look up this abbreviation) Brask Bros, resides 682 19th. Harriet Coffman was also at this address. Brask Bros. is listed as Automobiles & Repairs; Chevrolet Motor Car Dealers with locations at 2264 E. 12th and 2905 E. 14th. incorrectly as C. E. Coffman with Cochran Celli, resides 682 19th Street. !BIOGRAPHY: 1927 Interview with Elaine Coffman Kelly by Nick Cimino 4 Nov 1989 Ernest used to meet Elaine occasionally in San Francisco near where she worked for lunch. She was 17 at the time and working for Gorman-Kayser. !RESIDENCE-OCCUPATION: 1928 Coffman, E E h 885 Aileen ???? did he move back in with Mae? business at 616 55th and they bought the house at 614 55th. They had a community driveway going up. !RESIDENCE: 1932 at Ernie Jr.'s birth 511 Waller Street. St., Oakland; Mountain View Cemetery Records transcribed 11 Nov 1989; Cause of death: pneumonia. September 17, 1934, Ernest E. Coffman, beloved husband of Millie J. Coffman, loving father of Mrs.
Engel Mayne, Vivian and Ernest Coffman; son of Archibald and Harriet Coffman, brother of Viola N.
!BIOGRAPHY: From Ernest Coffman, Jr. April 2000- My dad-Ernest Sr. passed away when I was a toddler, so I don't remember him at all. From my calculations, I was 1 yr. 8 mos. and 13 days old, give or take an hour or so. 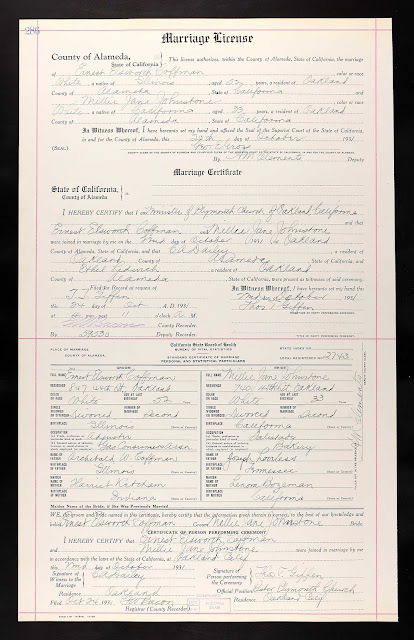 The death certificate says that his trade was a Collector & Adjuster, but I heard from his brother-my Uncle Otis Coffman Sr., that he was also in the tire business, with him, down on Broadway, in Oakland. It was near the big Presbyterian church, if I recall, for I remember stopping there to see Uncle Otis, when I was a little sprout. On his death certificate, it indicates that he died of "pyelitic uremia 133." Whatever that is. Also, other contributory causes were: "Acute bilateral pyelitia suppurative 133," and the doctor Theldore E. Schwarz, treated him from 9/11/34 until his demise 9/17/34, which in today's modern medicine, they probably would have given him some antibotics and sent him home. There was no operation and there was no autopsy. death certificate, it indicates that the above job ended in 1931, before my birth, so...the tire industry does make sense. It also states that he worked there for 24 years, being a collector and adjuster. Wonders of wonder. No 401-K or Soc. Sec. back then. sad Our friend, down in San Jose, is a teaching-nurse and indicated that the above diagnosis was "a problem with his kidneys, possibly a severe kidney infection, abscess, or similar condtion, which did, or ultimately would have, led to renal (kidney) failure. An added " P.S. was 'bilateral indicates both kidneys were affected. the number 133 may have been a medical record number or diagnosis category, but probably isn't significant to the cause of death.'" 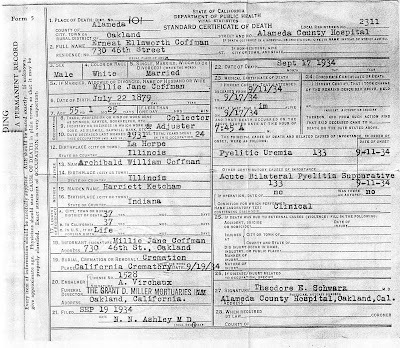 It's also noted that he died at the Alameda County Hospital, so...that to me, is Highland and was there because of the cash situation, I guess, seeing that that was the depression era. As for things my mother shared. Ha! Nada! At least not much of anything super-duper. She was a very quiet person when it came to sharing things of personal nature. Right up until the end. I do recall that she said that my Dad drove her to a park in lower Alameda County, which was quite popular back then. I believe that was near Sunol, but I couldn't prove it. I do have a couple of neat pictures of Dad. One, when he was a dapper 21, I guess. 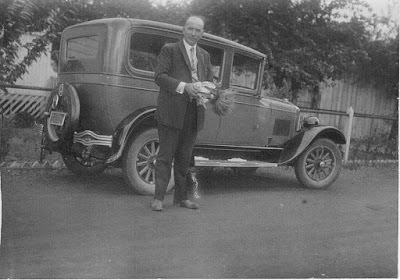 And, the other is of him with a duster and his automobile, which I guess he took pride in. End of history lesson for now. 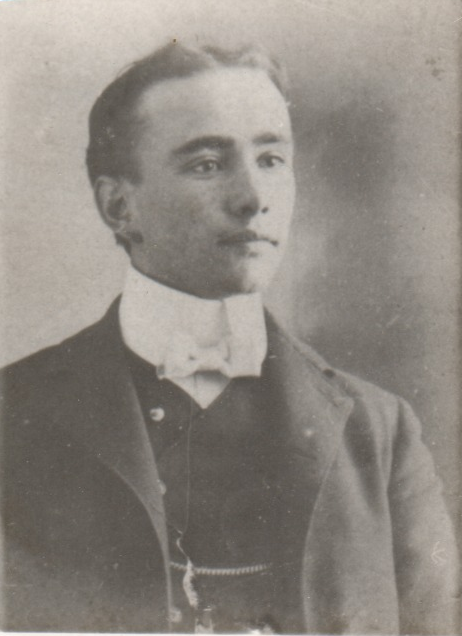 Next week we will feature Ernest Sr.'s father, Archibald Wilson Coffman 1850-1935.